I’m not always a huge fan of mashed sweet potatoes. But throw some bourbon into the mix, and now you’re talking! 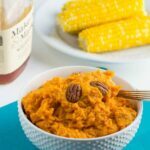 Bourbon Mashed Sweet Potatoes are wonderfully creamy and flavorful. Many mashed sweet potato recipes include the addition of brown sugar, but I think they’re already sweet enough without adding any sugar. 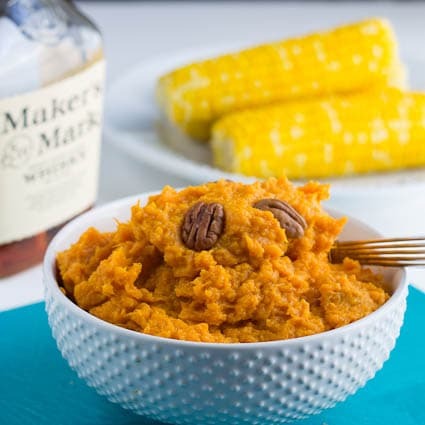 I love to serve mashed sweet potatoes with something spicy. They would go perfectly with this Spice Rubbed Slow Cooker Chicken. When choosing sweet potatoes, don’t buy potatoes that are too large. They tend to be fibrous. When I bake them, I always place them on a baking sheet because they tend to ooze and they’ll make a mess of the bottom of your oven if you’re not careful. If you have an affinity for cooking with bourbon, you may want to try Double Frosted Bourbon Brownies, Bourbon-Glazed Butternut Squash Spice Cake, Bacon Maple and Bourbon Cupcakes, or Bourbon Molasses Bread Pudding. They are all heavenly. Preheat oven to 350 degrees and bake sweet potatoes until very soft and starting to ooze, about 1 hour and 15 minutes. Let sweet potatoes cool a touch and then remove and discard skins and place pulp in the bowl of an electric mixer. Add half and half, butter, and bourbon and beat until smooth. Season to taste with cayenne, salt and black pepper. 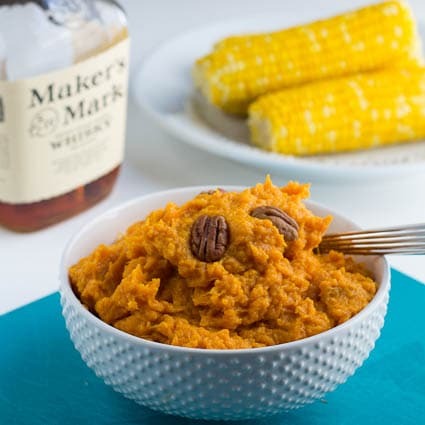 This entry was posted in Side Dishes and tagged bourbon, sweet potatoes. Bookmark the permalink. Not a fan of mashed sweet potatoes???? I didn’t even think that was humanly possible! I am so ridiculously obsessed with sweet potatoes–I love them in any way, shape or for. I also have a strong love for bourbon, so I am ALL ABOUT THIS! I am the same way – not a big fan of mashed sweet potatoes. So, now I know what to do next time – throw in some alcohol!